With this website we try to demonstrate how easy and important it is to dispone of the right means of communication for your individual purpose. 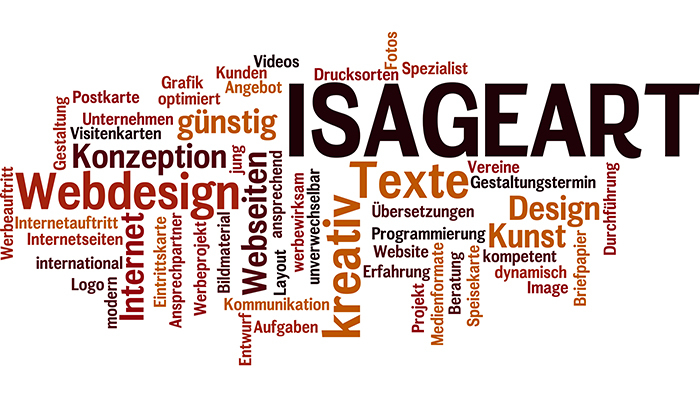 ISAGEART helps small and medium sized enterprises, but also associations and privats with every artistic and creative task. From the creation of your representative company logo to the elaboration of business cards, letters and other forms to the professional presentation of your objective on the Internet we are your internatinal creative partners. Furthermore we design every kind of format for printing or online pubblication such as stylish menus, personified postcards for your company or startling tickets for your own event. On request, we also deliver all the necessary base material - fotos, videos, appropriate texts. Thus, by engaging us for your projects you can save a lot ot time and money having to deal with just one competent creative partner.